A little known fact about me is that I have three university degrees (and am currently undertaking my fourth). One of them is a MA in history which I completed many years ago at Sydney Uni just for fun. History, and in particular social history has always fascinated me. 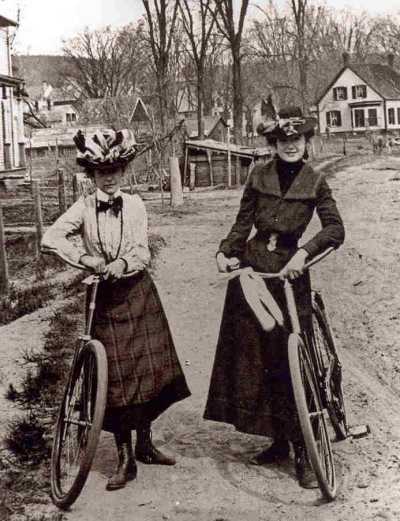 I came across a wonderful description of women who took up cycling in the Victorian era and the challenges that their attire brought. Also from the same magazine came a letter from a reader that described in detail the problems women faced when riding a bicycle in restrictive clothing. If I was compelled to go back to wearing a skirt on my wheel, I would give up cycling…. I shall never forget what I suffered with my arm, all the fault of my skirt. Some friends and I were riding one day last summer against a very heavy wind, when it caught my skirt and wound it around my pedal, throwing me. The rapid gait I was going caused the force of the fall to break my arm. It laid me up six weeks; then it was I decided to wear almost any other costume, but never a skirt, and declared if ever I recovered the use of my arm, I should wear bloomers; and truly glad I am that I did so decide, for never in the years of my experience as a bicycle rider have I derived such pleasure from cycling. I climb hills impossible before. It has increased my speed just double. I fear nothing from teams or roads, for if I slip I light on my feet. With my bloomers and heavy undergarments, leggins to my knees, a corset waist, and in cool weather a double-breasted box coat, which amply protects me from chilling, I enjoy my riding. It would be interesting to know how many women actually rode bikes back then. The rich women would have ridden for fun, while the poor working class women would have thought of it as merely a mode of transport. Haven’t things changed in the past 100 or so years. Women are ‘allowed’ to do all manner of things now. At least in western society anyway. There were also thought to be health implications and the same magazine contained this sage advice also in 1894. Another feature of riding the wheel is that so many portions of the body are called into action. The arms, while extended and constantly in activity, are spared any pulling or reaching. This is a point in its favour, as few women can withstand the inroads upon the health caused by over-exertion in the arms. Heart trouble is one form of opposition to it. Cycling calls for activity, alertness, accuracy and grace in the upper portions of the body, but in no place is there an undue strain. It is no wonder some women dread becoming round shouldered in view of the fact that some riders stoop so over their machines. This is a fact to be deplored, but it should in no way reflect upon the exercise, as it is the fault of the individual, and does not accompany real skill. The straightest riders are the most expert, and, like bad walking, it is an unpardonable awkwardness. I hope you found my reflection of the past as fascinating as I did. Thanks for indulging me. I’m glad to be alive in modern times. From the look of those bikes (no brakes, no gears), it seems that they would have fit in perfectly as track cyclists. Also seems (unless photo has been mirrored), that the chain is on the other (wrong) side. Although no cars to worry about, wonder how much of a problem the horse poo would have been!